If you enjoy making things, this is a project that will not only save you money, but it is fun. There are a great many products being sold today that you can make at home following a few simple steps. The materials are not nearly as expensive as buying the finished product. For example, a fiber optic chandelier that is available in stores could end up costing hundreds or thousands of dollars. The best part is you can make the chandelier with items that are not expensive and they will look like they cost a lot more. The cost – approximately $15 to $20, depending on where you shop – and think of the sense of accomplishment you will have when it is finished. The items needed will include fiber optic cable, a clear, acrylic bowl, a hanging light fixture, the shell from a flood light and various other things such as a light bulb, glue, a drill and bits and epoxy. The instructions for making a fiber optic chandelier will vary according to the design that you prefer. The basics include cutting the fiber optic cable and removing strands to create the desired length for the light. The smaller the strands of fiber optic cable are the better the quality of the light, although very tiny fibers are dangerous. They can easily puncture skin. Another variation can be achieved by adding a colored screen at the bottom of the base that will be used. This will make the lights a different color. This fiber optic lighting is used in a variety of places today from homes to businesses, including nightclubs and anywhere else this ambient lighting is needed. They can be made into spiral, doughnut-like and virtually any other shape desired. Depending on the type of chandelier you are going to make – for a living room, dining room, bedroom or elsewhere – there is a benefit that you likely did not know. The fiber optic cables do not contain heat or electricity so they are safe to use around water and other sensitive items, such as plants. They are energy efficient. 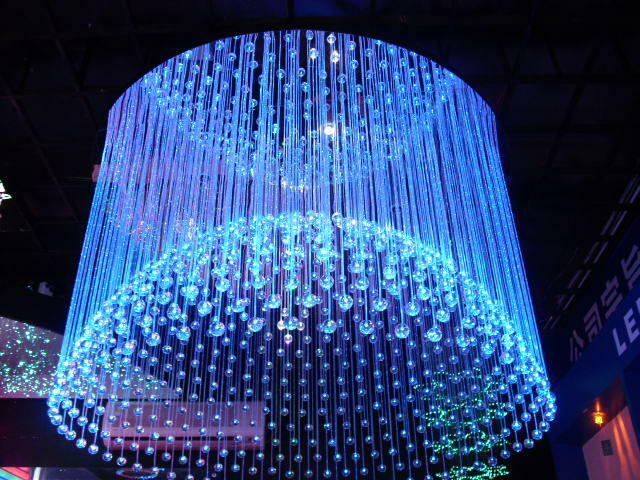 With all of these benefits, why not make a fiber optic chandelier for your home?